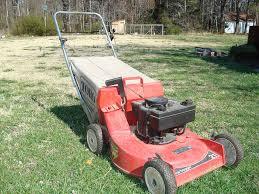 Our lawn mower and small engine recycling offers FREE disposal services so you don’t have to! Don’t waste your time, or money finding the nearest dump. just call us for a FREE pickup – that’s it! Our recycling center allows you the piece of mind that your old, dead or unwanted Lawnmower will be disposed of correctly. The oil and gas will be drained and recycled properly. We will strip the machine and salvage any reusable spare parts. After stripping the machine, it will then be recycled properly.